The Land Settlement Association (LSA) was created in July 1934. During the 1930s, twenty-ones estates of smallholdings were created by the Land Settlement Association to settle unemployed men on the land in England. Most of the early settlers were from the heavy industries including coal mining in the ‘Special Areas’ in the North of England, Durham, Northumberland and Cumberland. The first estate was created at Potton, Bedfordshire in March 1935. This was an estate of 30 holdings clustered around a Central Farm. Its development provided a model for the other 20 estates. The smallholdings were equipped to provide three main enterprises, pigs, poultry and horticulture, the ’three legged stool’ supported by the services of the central farm or estate service depot. By the outbreak of war 1,100 smallholdings had been created on 21 estates covering a 11,063 acres. 1,728 men had been moved to the estates as trainees, together with perhaps 6,500 others, wives and children. For about half it was a success. 850 men and their families were on the estates in September 1939 (400 as tenants). For the rest some remained near the estates, others went to London or towns elsewhere. As war became more certain there was a demand for skilled men in the heavy industries and coal mining and many were able to return to their former occupations. In the pre-war period the LSA also developed ‘Group Holdings’ in areas of high unemployment. These were part holdings of ¼ acre clustered in groups on which the man cultivated vegetables, and maybe kept a few chickens. 167 groups were formed with 2,565 group holders in nine English Counties and North Wales. Group holders were allowed to keep drawing their Unemployment Allowance. Between 1937 and 1939 the LSA also developed five estates of Cottage Homestead. By the outbreak of war 215 holdings had been created at Caversham, Reading; Cosby, and Elmsthorpe, near Leicester; Dunstable, Bedfordshire; and Long Lawford, near Rugby. A Cottage Homestead was a 2 acre holding with a detached cottage. Estates were placed near towns where employment opportunities were good for the teenage children of unemployed men who had little or no chance of returning to work in the ‘Special Areas’ in the north of England. These men were expected to grow vegetables for their own consumption. At the outbreak of war the scheme for the unemployed ended. The LSA was instructed to recruit men with agricultural backgrounds who could help maximise food production. 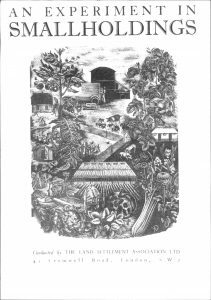 After the Second World War the LSA full time smallholdings were incorporated in Statutory Smallholdings policy within the context of Part IV of the Agriculture Act, 1947. This policy was aimed at giving the man with five years agricultural experience the opportunity to get his foot on the first rung of the ‘Farming Ladder.’ The LSA was allowed to keep its unique estate based smallholdings scheme supported by ‘centralised services’. The Group Holdings and Cottage Holdings were no longer something the Ministry of Agriculture wished the LSA to promote, as they were deemed to be out-with post war agricultural policy. The LSA did create a few ‘Stock Allotments’ collaborating with local authorities. These were an adaptation of the ‘Group Holding’ but the men were allowed to keep a pig on their Stock Allotment. During the 1950s the LSA’s estates with centralised services matured. The ‘farming ladder’ concept was working for some men but many were content with their LSA smallholdings. Though some thought the LSA scheme was not ideal, most were content to remain under the umbrella of the LSA’s centralised services. ‘Consultation’ developed whereby the tenants were given a say in the running of the scheme. 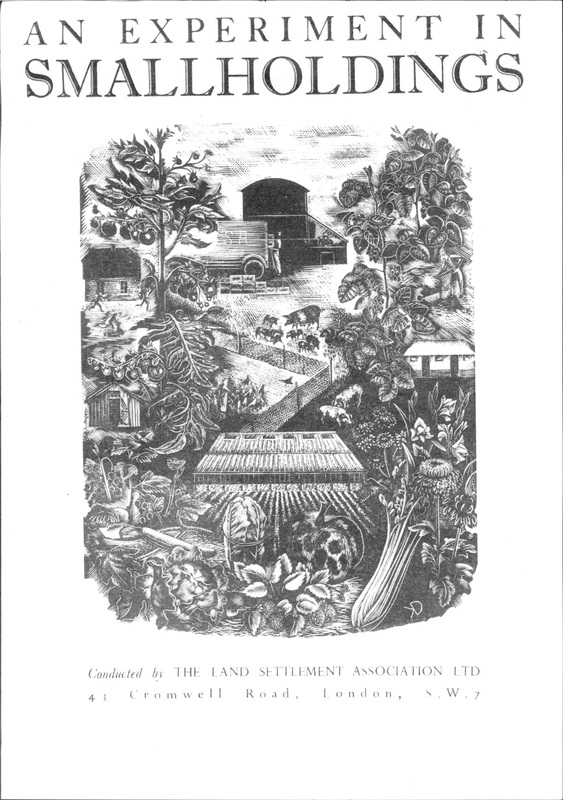 In the 1960s the Government set up a Committee of Inquiry into Statutory Smallholdings. It was chaired by Professor Michael Wise of the London School of Economics. The Committee issued two reports. Its first report looked at Statutory Smallholdings provided by Local Authorities in England and Wales. Its second was about the Land Settlement Association and other Statutory Smallholdings provided by the Ministry of Agriculture, Fisheries and Food. Wise noted that post war, the LSA smallholdings and those provided by County Councils, had played a part in promoting a stable and prosperous agriculture by attracting men to work on the land and providing them with opportunities to become farmers on their own account. They were convinced that there was no need to continue providing these opportunities but there was a responsibility towards existing with established businesses in horticulture. Holdings on horticultural estates were providing a good income for tenants. Wise therefore recommended that the LSA focus itself on the production and sale of horticultural produce. Estates which were mainly focussed on livestock and could not be converted to horticultural production were closed. The Wise Committee recommended that the LSA’s centralised services be continued but each of the eleven estates which were to remain into the 1970s should become autonomous co-operatives federated under a central body. The Ministry of Agriculture, Fisheries and Food accepted Wise’s first recommendation but did not support the second. The scheme therefore continued into the 1970s under the Agriculture Act, 1970 Part III as a specialised horticultural enterprise. There was a considerable build-up of glass both heated and unheated for the production of protected crops, principally of tomatoes and lettuce. Field cultivation of these crops also occurred together with self-blanching celery and other crops. Those who wished to continue with pigs and poultry were allowed to do so. ‘Tenants’ became ‘Growers’ though there was no change in their tenancy agreements but they were given more say in the running of the scheme. Tenants were appointed to the LSA Executive Committee by the Minister of Agriculture, Fisheries and Food. The LSA had become smaller over the years. By the mid-1970s there were only 10 estates and 530 tenants. The early part of the decade appears to have been a period of positive development for horticulture with a large build-up of glass on estates especially at Newent, Sidlesham and Snaith. However, by the end of the decade intensified competition, particularly from the Netherlands, high oil prices and very high interest rates were undermining the viability of tenant’s businesses and the scheme. In 1980 P A International were appointed by the Minister of Agriculture Fisheries and Food to investigate the provision of centralised services by the LSA. The Minister also commissioned the Central Council for Agricultural and Horticultural Co-operation to look at the LSA’s marketing arrangements. Both reports were received in the autumn on 1980. There followed two turbulent years for the LSA culminating in the announcement on 1st December 1982 that the LSA’s centralised marketing scheme was to close in April 1983. Tenants were allowed to buy their holdings, after clearing any debts. This, in fact, debarred some tenants. Help was given to those estates which wished to form independent marketing co-operatives. There were 522 tenants at the end of 1980. The LSA ceased to be the Minister’s agent on 31st December 1983, but continued in existence until 1991. It’s surplus assets were transferred to a new charitable trust, the LSA Charitable Trust which continues to operate. About 200 former tenants, some within the new co-operatives tried to make a go of it. Help was given to growers at Chawston, Fen Drayton, Foxash and Newbourne and Newent to form co-operatives. Elsewhere some growers joined existing co-operatives local to their holdings. In November 1983 growers at Fen Drayton, Fulney, Foxash and Newbourne created a new marketing organisation under the banner ‘English Village Salads.’ Meanwhile 280 former tenants launched a legal action to sue the Minister of Agriculture, Fisheries and Food for breach of contract. The House of Lords in 1985 found in favour of the former tenants but it was not until the early 1990s that the Minister made an out of court settlement of over £7 million. Sadly this was not the end of the matter. Because the settlement was out of court, the sums paid to individuals were subject to income tax. Despite repeated attempts by Members of Parliament over nearly ten years, the Government refused to overturn the Inland Revenue’s decision.